So, I went to the library again today. I was going to be a real writer! But seven or eight minutes after I sat down, a voice announced that the library would be closing in fifteen minutes, and the lights went on and off. I tried hard to write for the next ten, but then they announced it would be closing in five minutes, and they actually sent employees around to harass anyone who was still on the second floor. Darn. Kinda makes me wish I hadn't spent the first fifteen minutes at the library on the toilet. I finished editing another Outcast episode, this one due to hit toward the end of August. When I got to the end, I realized it was going to be about ninety minutes long, so I decided to split it in two. Maybe that's crass of me, but I walked around the block and recorded about twenty more minutes for it so the two episodes will be about an hour each. Hopefully somebody feels that's extra content, instead of being ripped off. Nothing to report here. Yeah, I wrote, a little. All it would've taken was a teensy bit of extra effort, and I would've been finished with JIADVAPNATSR (that's "Journey Into Another Dimension..." for you sane folks). Then who knows what I could go on to achieve? P.S. 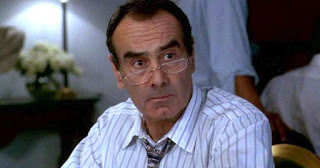 I thought about Dan Hedaya today, just before posting this, thinking about him (specifically, how Alicia Silverstone was supposed to have been the fruit of his loins in CLUELESS), and a bit sad he died, remembering seeing him in a "Person of Interest" shortly before . . . his passing? I doubted my memory, and looked it up. July 1st . . . already?